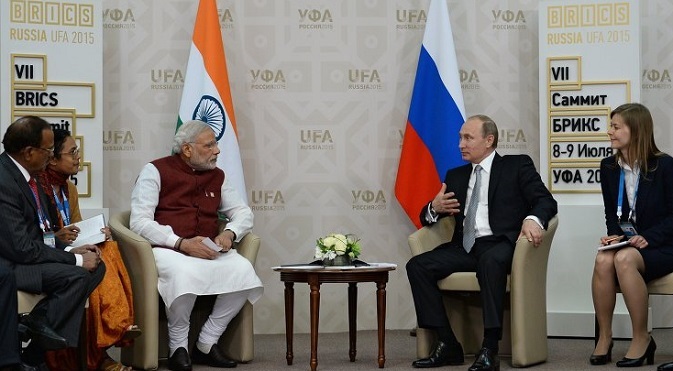 Russian President Vladimir Putin and Indian Prime Minister Narendra Modi met for close to an hour at Ufa on Wednesday. Among other issues, Putin said the process of India’s accession to the Shanghai Cooperation Organisation had begun, and India would be a full member at the next summit. Among the first engagements Indian Prime Minister Narendra Modi held on his arrival at Ufa on Wednesday was a crucial meeting with his host, Russian President Vladimir Putin. Modi came in from Astana, the Kazakhstan capital, to Ufa, capital of Russia’s Bashkortostan Republic, for the BRICS and SCO summits scheduled over the next two days. "I am hopeful of productive meetings and interactions at the BRICS and SCO Summits, forums we attach immense importance to," Modi said in a statement. "India attaches high importance to BRICS. It is a great forum that can contribute effectively to mitigate global challenges. BRICS also has a very crucial role to play in furthering world peace and security and ensuring we leave behind a better planet for our future generations," the Prime Minister said. "I am looking forward to developing the cooperation (between the two countries)," Putin said after the two leaders met on the eve of the BRICS summit. The SCO summit is scheduled on Friday. Putin, the host of the BRICS and SCO summits, told Modi, "We are beginning the process of full-fledged inclusion of India into the Shanghai Cooperation Organization." He emphasized that it was "a very important event." The Indian Prime Minister thanked the Russian President for the warm welcome he received on his arrival at Ufa earlier in the day. Modi also specially thanked Putin for initiating the process of India becoming a full member of the SCO. "Under your (Putin's) leadership in BRICS, India has become a member of SCO. I am very grateful," the Indian prime minister said. The two leaders discussed ways to carry their special strategic partnership forward and exchanged views on critical global issues like the situation in Afghanistan and the rapid spread of the Islamic State terrorists. According to a source who was privy to the talks, the Russian President briefly outlined the situation in Ukraine. Modi raised the issue of enhanced defence cooperation and how to go ahead and jointly produce defence hardware. The issue of Pakistan’s continuing support for terrorism was also raised, the source said. On a lighter note, the Indian PM thanked the Russian President for helping to make the International Day of Yoga (on June 21) such a success across Russia and said Yoga would provide holistic healthcare to the world. Putin light-heartedly said that Yoga "looks difficult," which is why he has not tried it. Putin, who holds an 8th Dan black belt in Karate, said, "I don't know how to do yoga. When you people do it, it looks difficult. That is why I have not tried it." "It is very special to be in Russia, a nation whose remarkable friendship with India has always been known," Modi said in a statement on his arrival in Ufa. Talking of the close relationship between India and Russia, said he will be visiting Russia again later this year for the annual bilateral summit meeting.